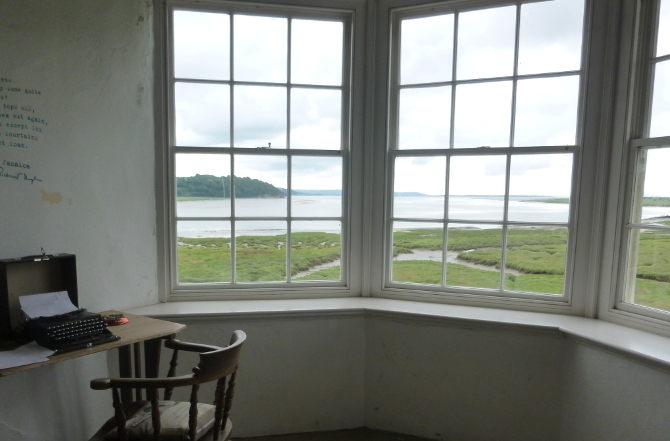 Within the grounds of Laugharne Castle is a stone summerhouse where Dylan Thomas and author Richard Hughes would come to write. Today there is a note from Dylan’s wife Caitlin warning him not to leave the radio on and run the batteries down. More magical, however, is the fact you can turn on the radio and hear Dylan and Richard nattering (might be actors, but who can say?). What voices from history would you like to overhear? Can you grant your wish to a character in a story? If you write or create something prompted by this, please send an email to judydarley(at)iCloud.com to let me know. With your permission, I’ll publish it on SkyLightRain.com. This entry was posted in Writing prompts and tagged creative ideas, Dylan Thomas, inspiration for writers, Laugharne, story ideas, writing inspiration by Judy. Bookmark the permalink.